This beautiful bronze bowl was discovered in 1854 in a river flowing into Lough Scur, which lies just north of Keshcarrigan in Co. Leitrim. 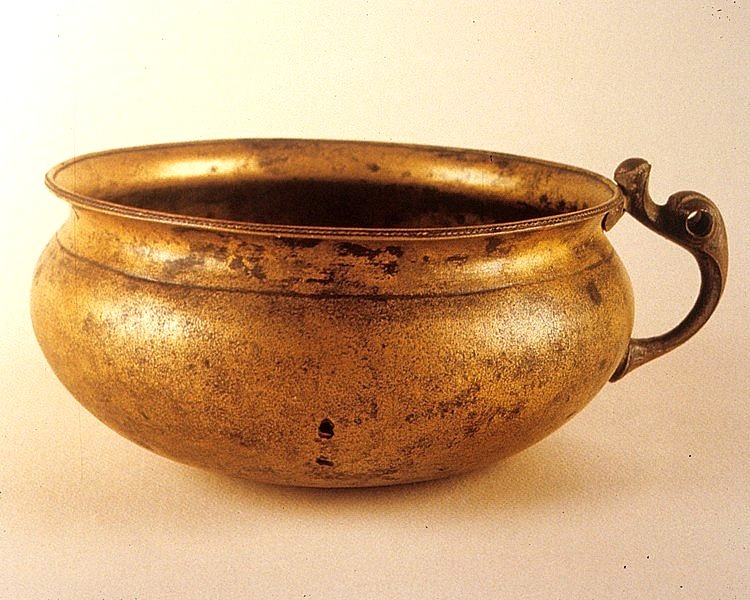 Iron Age in date and measuring approximately 14 cm in diameter, it may have been a ceremonial drinking cup. The bowl is fashioned out of beaten bronze and was probably finished on a lathe, as a chuck mark is visible on its base. The handle is soldered on and is decorated with a distinctive bird’s head motif, which may represent a swan or duck. The bird’s head contains two eyes sockets and these may have originally held red enamel insets. The remainder of the bowl is plain except for a hammered zig-zag line along the out-turned rim. This simple but striking artefact is reminiscent of 1st century AD bowls from southern Britain and it may represent an import. It would undoubtedly have been a prestigious item and its deposition in a watery context may represent ritual activity rather than an accidental loss. I was not aware that such stamp had been struck!